It is hard for client’s to part with items when they paid a lot for them. I started O.P.E.N. 4 Selling for those items that are still beautiful and valuable and need new homes. 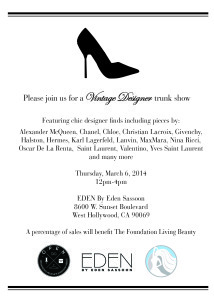 We are having our first Vintage Designer Trunk Show Thursday, March 6th. Please find the invitation below and join us!